Forced to sit on cozy couch by fire until table frees up. Place feels like someone’s kitchen, only much larger. Mismatched old wooden tables, wood floor, paintings on walls. Oops. Forgot to ask for no coriander. 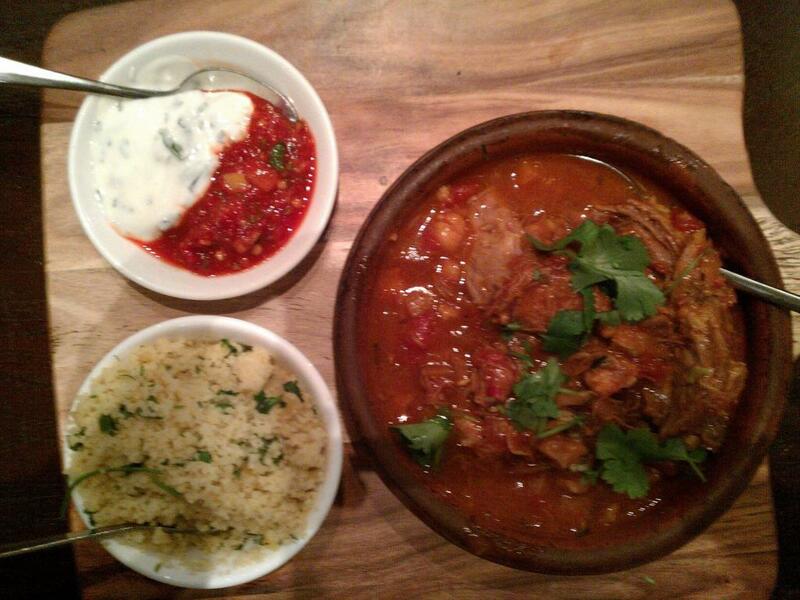 Two of these three dishes contained coriander. I surgically removed it from the main bowl, and tolerated the tiny amount in the couscous. The red harissa was ridiculously spicy. The spoon for the yoghurt touched it, and that almost made the subsequent spoonful of yoghurt too spicy. At some point, this lava got onto part of my tongue, rendering it inoperable for the rest of the meal. The shredded meat was very soft and flavourful, and the slightly spicy tomato sauce/soup was equally tasty. I challenge anyone to cut shredded meat in a bowl of liquid. 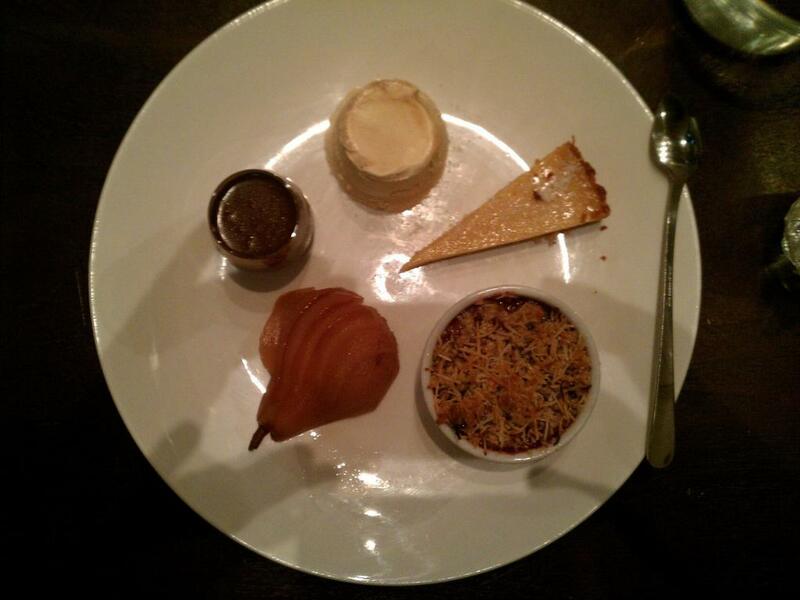 Baileys and espresso semifredo, chocolate cointreau pot, salted caramel tart, poached pear, berry and apple crumble. Semifredo is ice cream. Good ice cream, but ice cream nonetheless. Few stray grains of salt in it. Salted caramel tart is caramelly and buttery. Wouldn’t want any more than one sliver if this. Salt is sprinkled on too, and therefore uneven. Chocolate cointreau pot is very rich, and tastes like those wine bottle chocolates, but smoother. Poached pear is soft, and has an additional non-pear fruity glaze. Pear can’t compete with plateful of rich and sweet things. Berry and apple crumble has very strong berry taste, and interesting toasted shredded coconut on top. No pastry. Nicest of the five. This dessert was just a bit too big.